What does "thoughts become things" mean at all? I'm currently in the middle of reading a book called "choose them wisely" by Mike Dooley, hence the name of the blog's url :) I'm the kind of person who really believes in all this energy that exists all around us, both the positive and the negative. You have to be careful in what thoughts you choose, because thoughts become things! It's kind of hard to explain the whole concept, but basically you are in charge of what you want to think about in your mind, and those thoughts that you think will BECOME. That is why you have to think thoughts you want to be real, so you must ALWAYS think positive thoughts! I know sometimes it's really hard to do so, but the more you think the good thoughts, the more it becomes easy. "a new earth" by Echkarte Tolle is a book I would HIGHLY recommend you to read if you want to understand this more in detail. I'm actually thinking about reading it again once I go back to Istanbul (the book isn't with me). They also have the book translated in Tukish but I forget what it's called. As I mentioned, I will spill my thoughts out in this blog, mostly on my progress in becoming Miss Turkey 2011 :) Do you see where I'm getting at? The more I think of something, the more I want it, the more I feel it, the more it gets real. All of these things I'm getting at sends out my energy to the universe and brings me closer to my thoughts and closer in becoming a reality. If you guys really believe in me and deeply support me, then you're sending out your energy to the universe as well, and that's what I want, because if you think it too, then there's more positive energy!! :) I hope all this madness makes sense. Anyhow, today's progress went great. I went to the gym this morning and it felt good! Since I went in the morning, there were about 7 people maybe so I was able to concentrate and focus a lot more. 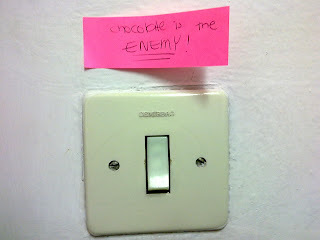 I stuck three post its around my room that read "Chocolate is the enemy" and you know what? It really helps. But that's only because I believe in it. I have a sweet tooth so when I see the "chocolate is the enemy" it reminds me of my goal and really do stay away from it. I put the main post it above the light switch, which is next to the door, so I see it each time I leave the room, which is a lot since I go to the bathroom on an hourly basis. I'm not saying I'm going to quit eating chocolate forever. I can eat it once in a while just to make the craving go away. On a bad note, I did eat 5 pieces of bread today but that was the only source of carbohydrate that I got so I guess it isn't THAT bad. I "boiled" two eggs but they weren't hard when I removed it from the heat, so they weren't done propperly so I couldn't eat them. I ate 4 pieces of pouttie bour in the morning before I went to the gym, then the "eggs" and I ate a sandwhitch before going to class and an apple after I got back, and I think that's it becuase I can't remember what I ate afterwards. I read somewhere that when you're doing a diet, you don't just change what you eat, but you need to change your entire lifestyle. Which is really true because if you're going to change what you eat, how you eat, and when you eat, then you're chaning the way you live because, when you connect the dots, you live by eating. Always think positive:) no matter what people tell you don't let them get you down. i love u ;** thinking positive is the best thing to do in your life .. i`m trying to do that now !